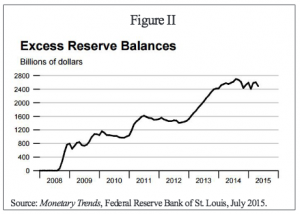 The Federal Reserve (Fed) influences interest rates by purchasing U.S. government securities in the secondary market with newly created money. This capital flows into the system when the original holders of these securities deposit the payments into their bank accounts, says Dr. Richard Ebeling, distinguished professor of ethics and free enterprise leadership at The Citadel in Charleston, South Carolina. The banks safeguarding these deposits now have larger cash balances and can offer more loans at lower interest rates to individuals or to other banks under the cash minimum. The process works the opposite way when the Fed sells these securities instead of buying them. – It has injected around $4 trillion of new money into the system. – It has kept inflation down by having nearly $3 trillion sitting in the banks as excess reserves. – By doing so, it prevents the free market from attaining its own balance. 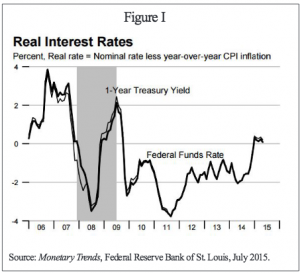 – But by pushing interest rates down it’s creating an imbalance and it’s also distorting the economic cycle. – Its policies could set the stage for another bust (market correction) following an artificially induced boom. Interest rates, like any other market prices, provide information to participants about what consumers want and what the cost for producers to bring those goods or services to the market. The Fed’s increase in the money supply leads to inflation and to an initial investment boom which is unsustainable in the long run. Thus, ending its power to manipulate the money supply is essential.